On 28 July, the Japanese government embarrassed itself by allowing its Ministry of Defence (MoD) to republish in English a grotesque piece of anti-China propaganda which in its lack of sophistication, anti-China bias and cartoonish style is worthy of the worst days of the Soviet Union and its highly discredited series, “Whence the Threat to Peace”. The MoD document, originally published in Japanese on 29 May, the start date of the ShangriLa Dialogue 2015 in Singapore, is a graphic presentation which contains almost no supporting analysis in prose. This in itself represents a huge mistake. No foreign ministry taking a careful eye to diplomatic relations with its neighbors would normally rely so heavily on “pictures” for such complex issues. There is some effort at balanced analysis in the fine print, but overall the first graphic is alarmist and seriously misleading. It captures none of the complexity of the history of rival claims and rival military moves. This ill-considered move by Japan comes after it has begun negotiating with the Philippines on the involvement of Japanese warships in patrols of the South China Sea, after Japan joined the escalating chorus of states making exaggerated claims about a Chinese military threat to commercial shipping in the South China Sea, and after Japan has escalated its own naval construction program. Japan has every right to do these things, but we in the region must weigh the consequences. My assessment is that Japan’s entry into the military dimensions of the South China Sea, until now a very low level conflict, mostly political with some military dimensions, may come to be seen as a potential threat to general peace. There are many grounds for such a judgement. Here are three. First, the world’s biggest navy, the United States Navy (USN), is already very active in the South China Sea to deter any possible escalation to actual military conflict. Supported by regional allies, the USN is entirely capable of handling any likely contingency given the strategic priorities of littoral states. Adding the world’s fourth biggest navy into the military mix, alongside the world’s two biggest navies, is an escalation of hitherto unimaginable (almost hysterical) proportions. Second, the MoD paper is, through its over-simplified mis-representations, a direct affront to China, a country with which Japan is already engaged in quite serious maritime disputes and political conflicts. The paper will serve to escalate tensions with China because of its propagandistic character. 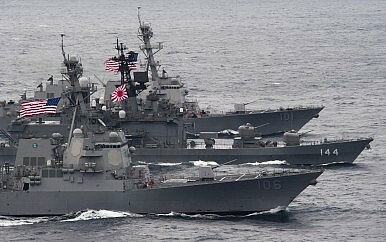 It will be seen by China as yet further evidence that Japan cannot be trusted to maintain normal political relations. The third reason is the most serious. The Japanese government refuses to acknowledge this consideration, and it is this aspect which is most vigorously stoking the fires of mistrust in China. All Chinese military officers engaged in strategic policy know that Japan, in signing the San Francisco Peace Treaty in 1951, specifically surrendered its claim to sovereignty over the Paracel and Spratly islands (Article 2f), having in earlier articles, surrendered any claim to Korea, Taiwan, the Kurile Islands, and Pacific territories administered under a League of Nations mandate. Even though neither of the rival Chinese governments in 1951 were represented at the San Francisco Peace Conference, both have interpreted the Japanese renunciation of claims to the Paracel and Spratly Islands in their favor, especially since both the ROC and PRC had lobbied for that. For officials in China, especially the armed forces, Japan’s efforts to insert itself in the South China Sea in any way, but especially on a matter of territorial sovereignty, which was the subject of Japan’s express commitments in the 1951 Treaty, is like a red rag to a bull. Legalities do not count here. For Chinese military officers, this is raw emotion because of Japan’s war record in China, a history evoked in some way several times every week on Chinese TV. The Japanese Foreign Ministry would be wise to withdraw the MOD’s paper and reassert diplomatic common sense. Japan’s military involvement in the South China Sea through its intent to “patrol” the maritime space will be seen in China as a hostile act, and possibly as the most hostile military act by Japan towards China since 1945. Japan will justify its military activity in the South China Sea, as it did in its recent defence white paper, by reference to the need to deter threats to commercial shipping. This threat is entirely fabricated or imaginary. China has never threatened commercial shipping in the South China Sea. China is engaged with the United States in a contest about freedom of navigation for warships in the Exclusive Economic Zone. As senior naval officers with any sense of history will attest, there is a vast difference between this sort of occasional contest about military freedom of navigation in an EEZ (a right which the United States and its allies defend very well), and a sustained threat to commercial shipping. Moreover, China depends more than any other country in the world on the continued peaceful passage of commercial ships through the South China Sea. China also depends for its economic prosperity on two-way commercial shipping with the United States and Japan, the two countries which are now (somewhat strangely) alleging a threat from China to their own commercial shipping. The essence of common maritime security interests in the Pacific has been done a great disservice by the Japanese MoD’s cartoon map with red arrows showing China’s advances in the South China Sea. The suggestion being made by Japan and other governments that creation of an airfield by China on a submerged feature long occupied by China is a new threat to peace, while incontestable at the hypothetical level, is laughable given the complete absence of any evidence of Chinese intent to use that airfield for military expansion beyond the Spratly islands themselves. The misinterpretation (the intelligence failure) arises because those making it do not appreciate the history of the islands territories or China’s claim to them. Of special note, there are senior officials in ASEAN countries who were occupied by Japan in the war who view the Japanese moves into the South China Sea as highly inappropriate for the historic reasons mentioned. Japan needs to be very careful. There is talk in the Philippines, as reported by Malcolm Cook, that the next President, due to be elected in May 2016, will walk away from the country’s South China Sea policy, seen by some as conflict enhancement, a policy that it has been pursuing for two decades. If that happens, the political complexion of the South China disputes will change significantly for the better. More importantly, Japan’s newly militarized South China Sea policy would have nowhere to go.